Columbia was a goddess-like female figure who was common representation in art of the United States, as The Goddess of Democracy. The Latin term derived from Christopher Columbus, "The lands of Columbus". Columbia is often a name of vessels used in exploration. She is seen as virtuous and protective, the symbol of American pride and progress. Miss Columbia's popularity declined after the 1920s, as she was replaced by the Statue of Liberty as the female symbol of America. Columbia was introduced by black poet Phillis Wheatley (1753–1784) in her 1776 poem, "To His Excellency George Washington". Wheatley's poem was based heavily on classical Roman sources, which she used in translation, and as befits a model of Republicanism, Columbia is garbed in Roman dress. Washington was impressed and asked to meet Wheatley. The term caught public fancy and many places in the United States were named after her, such as the District of Columbia, Columbia University, and the Colombia River. Before Columbia came into wide use around 1790, America was often represented as an Indian princess, especially in European cartoons. In 1792, a statue of Columbus was raised at Tammany Hall in New York City and an eloquent oration was delivered by Mr. John B. Johnson. A toast of honor was given, "May the genius of liberty, as she has conducted the sons of Columbia with glory to the commencement of the fourth century, guard their fame to the end of time." In a 1872 painting by John Gast, "American Progress," Columbia leads civilization to the westward frontier with American settlers. Columbia usually was disdainful of aristocracy and royalty, but was of mixed feelings about imperialism. As an iconic image of America, Columbia was commonly used in World War I, until displaced by the Statue of Liberty in the 1920s. By 1950, the image was much diluted, seen as antiquated and is seldom seen today. A Hollywood studio took the name "Columbia Pictures" in 1924 and still features Columbia's image at the start of its films; the studio is now owned by Sony of Japan. The name without the image remains more common, as in the Columbia Broadcasting System (CBS) or in the space shuttle Columbia, and Columbia Encyclopedia. Many cities attribute the name Columbia such as Columbia, South Carolina or the Columbia City of Washington, Indiana and Oregon. Uncle Sam, by contrast remains the male symbol of America. 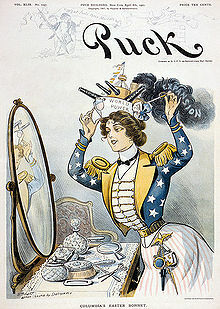 Though commonly, Uncle Sam is more representative of the government of America than the people or the ideals that made America exceptional and unique. Unofficial national anthem until the Star Spangled Banner. The song is still used today for the entrance of the Vice President. Enjoy'd the peace your valor won. Let its alter reach the skies. Peace and safety we shall find. The happier time of honest peace. Columbia University New York City. ↑ Previous poems by others had used the term in the 1760s, but they were forgotten. This page was last modified on 9 April 2019, at 01:46. This page has been accessed 20,190 times.